During his six day tour in Africa last month Bush spent three nights in Tanzania. President Kikwete is a close friend of his and that friendship has paid off for the country. In Dar es Salaam Bush signed an agreement to give Tanzania over 700 million dollars for infrastructure repair (roads, electricity, clean water) and AIDS/malaria prevention over the next five years. It is the largest gift to date from the Millennium Challenge Corp. Tanzania has made good use of the money given in 2005 so they apparently have warranted more. Kikwete's recent firing of his prime minister and sacking of his cabinet for corruption has further endeared him to Americans and Tanzanians. Bush has been talking a lot about how only governments with strong democracies and less corruption will be getting donations. It is encouraging that the rest of the world is learning what a peaceful democracy Tanzania is. If anything, it will bring more tourist dollars as people flock there instead of their neighbor Kenya. In Dar es Salaam Bush made a visit to Amana Hospital in Ilala district. This was the hospital where I trained with the midwives in 2000. A new spiffy maternity unit was built in 2005 and apparently some of the Millennium Challenge money was used to make more units to help with the treatment of HIV and Malaria (hence the visit from Bush). The photos of the outpatient waiting area were impressive. Some good paint, tiles and scrubbing went into that place before his visit. 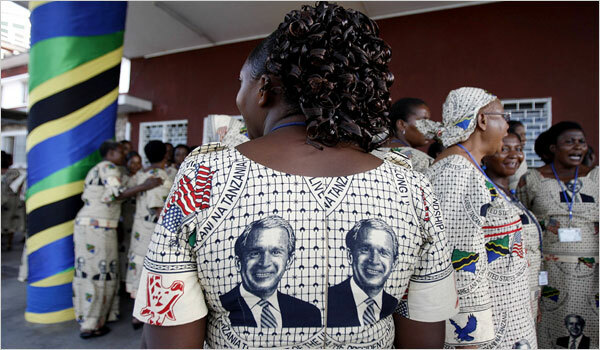 Bush spent one day in Arusha to visit a bednet factory, district hospital (built with American funds) and the Emusoi Center school for Maasai girls (the Catholic version of the Lutheran's Maasai Girls Secondary School). He announced today that we were donating bednets for every child under the age of 5 in the country. Bush is smart for focusing on this part of his legacy at the end of his term. The money the US has spent on these development projects so far through the Millennium Challenge has made a lot of difference. As we watch our tax dollars go to the government we like to tell ourselves that maybe all our money will go to these efforts. There is an old joke told in Tanzania: Swahili was born in Zanzibar, it grew up in Tanzania, became sick in Kenya and died in Uganda. Julius has taught me that even within Tanzania there is a pecking order as to who speaks Kiswahili the best. When the Arabs came to the East African coast (almost 1000 years ago) they called the people they met the "Coastal People" or "Sahil". As time went on the word became Swahili. All the tribes along the coast at that time spoke a common language along with their tribal languages. This language became known as Kiswahili (the language of the coast). As time went on and more foreigners showed up, the language adopted words from Arabic, Portugese, German and English. On the islands of Zanzibar, Kiswahili became the main language for the Africans who were brought there as slaves by the Arabs. Hundreds of years later it is still the only language spoken on the islands. Up to today, Zanzibar's Kiswahili is still seen as the purest in the country, followed by the coast, then the rest of the mainland. Julius grew up in Tanga, a small city on the coast and he gets compliments from other Tanzanians here for his "good Kiswahili". I (Sara) have been dabbling with Kiswahili since I studied at the University in Dar es Salaam in 1996. Over the years I have bought loads of dictionaries, study guides, grammar guides, CD-Roms, CDs. I have everything at my disposal. Plus, my husband is fluent! I should be fluent at this point too. When a trip to Tanzania is coming up I cram like crazy, but once home my skills start to fade. I once asked Uncle Phil how he got so fluent in Spanish (he is a priest for a parish with a huge Hispanic community). He said that he made the decision in seminary to study Spanish for an hour a day. It was so simple and made so much sense! If I studied Kiswahili for an hour a day, think of the progress I would make. I am making a challenge to myself to do just that. Hopefully I can blog about what I am learning along the way, just to make the lessons stick. Kiswahili is not a hard language for an English speaker to learn. There are many rules but unlike English, they are not broken very often.